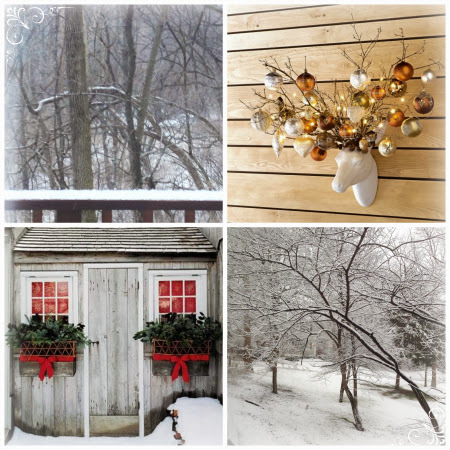 Today I created a card for the SEI Lifestyle Blog Cozy Winter Inspiration challenge. The challenge was to create a card, layout or other project using the following photo combination for inspiration. We had some snow a few weeks back and I had some perfect photos of snowy trees but they still have not been developed and I am currently without wheels and could not get them done so I decided to create a card. What a rough time I had of it. I was happy to use my Martha Stewart Punch all over punch as I have had it for quite some time and haven't had an opportunity to use it yet. I also have had this Reindeer die for a long time also unused so it was perfect for this challenge. I layered the card and added the sentiment and the reindeer. That is when the trouble started. Some of the glue from the reindeer left a smudge on the cardstock. This is where all the glitter on everything and the white paint came in. I tried cleaning the smudges, erasing them, inking them. There was still a telltale smudge of glue so then I decided to do a bit of paint dabbing. That still didn't quite do it for me and I spotted this little container of silver sparkles on my desk. Out came the glue stick again and I added some sparkle until I was satisfied. 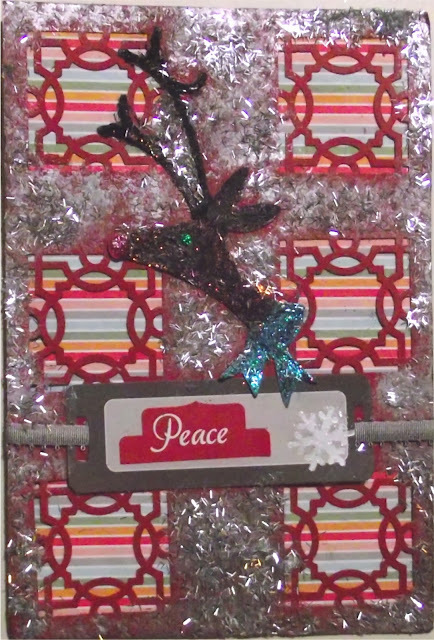 I then chose my sentiment of 'Peace' which gave me the opportunity to also enter it in the Colorful Creations Say It With Words December challenge, added it to the tag, found some silver ribbon and done! Hope you have enjoyed this, and are enjoying this great holiday week! I'll be back tomorrow with more as being without wheels and I will be spending the weekend housebound. Great card. Love the sparkle and shine!